This 19-year-old woman fractured her nose at age 4 and again in high school, which resulted in breathing problems at night. She wanted improvement in her breathing as well as changes to the shape of the nose, including removing the hump and making the tip of the nose narrower. In addition, she was a college student and wanted to have this surgery performed over spring break to avoid missing class. 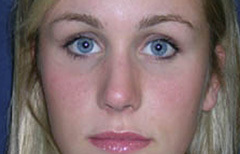 She underwent rhinoplasty through a small incision on the skin below the nose. The hump was smoothed using fine rasps or files. 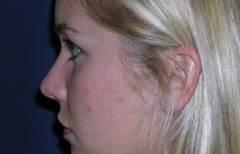 The nasal bones were narrowed and the cartilage in the tip of the nose was made narrower to give the tip better projection. 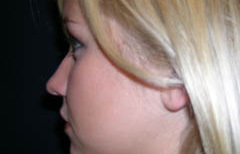 Cartilage from the nose was also placed in the tip area to give it a more refined shape. She returned to the office a week later and had all the splints and sutures removed. Her photographs are shown six weeks after her surgery. She is breathing well through her nose and is very happy with the new refined shape.